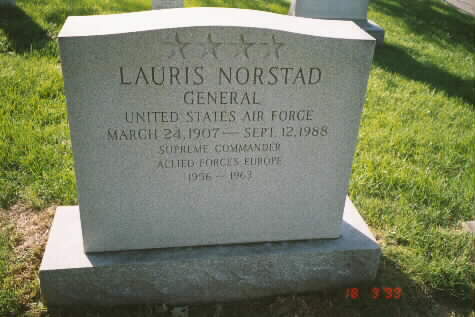 Lauris Norstad, commander of U.S. and NATO forces in Europe during the Berlin crisis, died of cardiac arrest, at Tucson, Arizona, Medical Center. He was 81 years old and lived in Tubac, 40 miles south of Tucson. Bradford C. Oelman, Vice President for Corporate Relations of Owens-Corning Fiberglas Corporation, which the General served as chairman and chief executive officer from 1967 until he retired in 1972, said yesterday that it was not immediate known what caused the cardiac arrest. A former associate of the general at the corporation said that he had been admitted to the medical center on Sunday, suffering from an intestinal infection. A lanky U. S. Air Force officer, he gained the respect of President Kennedy for his workmanlike manner in which he oversaw forces of the alliance during 1961 crisis in which East Germany cut off East Berlin from West by building the wall that seals it off from West Berlin. Yet had his differences with the Kennedy Administration, many of whose member regarded him as part of a dynasty of high commanders with links to President Eisenhower, who had appointed him to the European posts in 1956. He saw his own role as that of an international Allies servant, and not only as a U.S. General, a view not well-received in the Kennedy Administration. In addition, he contended that the Administration ascribed too much importance to conventional weapons in nuclear age. In a television interview in September 1962, for example, he stressed his contention that tactical nuclear weapons must be seen as a key part of the alliance's arsenal. "If there is any question about out willingness or our ability to use these atomic weapons," he said on the CBS documentary show "The 20th Century," "it is my judgement that we have lost a great part of the deterrent effect which is the important thing." His time as NATO commander was also clouded by differences with administration of Charles de Gaulle, President of France, and by various other problems of the alliance, notably military weaknesses that the general himself publicly cited, including a delay in modernizing the alliance's weaponry. As commander, he repeatedly urged that NATO be strengthened in manpower, in quality and in equipment. One of his innovations was the establishment in 1961, using existing formations, of a fast-moving multinational unit. Norstad, who had held lesser NATO commands for five years before becoming its commander, made it clear that he viewed the task of NATO as posing as a "shield" of conventional armaments that would force any Soviet attackers to fight, while at the same time maintaining an atomic retaliatory power that could cause the "absolute" destruction of the Soviet Union's ability to make war. After he stressed this view in a June 1957 speech, the Soviet Union officially branded him a warmonger. But his efforts to build such a shield met obstacles. Relaxation of tensions and pressures for economies among Allies delayed his program of building a NATO force of 30 divisions. He was scheduled to relinquish his NATO command on November 1, 1962, but Cuban missile crisis that Oct prompted NATO to ask him to stay in the post until early in 1963. Did turn over his other post, commander of U.S. forces in Europe, to Lyman L. Lemnitzer, in November Then on January 2, 1963, he turned over the NATO command to Lemnitzer and retired from military life. Born March 24, 1907, at Minneapolis, Minnesota, the son of Rev Martin Norstad of an Immigrant Norwegian family in Iowa and Marie Johnson Norstad. When he was about 3 years old, the family moved from Minneapolis to Red Wing, Minnesota, town of about 10,000. He went to the United States Military Academy, graduating 139th in class of 241 in 1930. Although had been assigned to the Cavalry, he was sent to Mar Field, California, for training in the pursuit section of the Army Air Corps Flying School and won his wings. He was formally transferred to the Air Corps, December 22, 1931. Early in his career, he showed a talent for staff work. In World War II, he was assigned as assistant intelligence officer with the Bomber Command Headquarters at Langley Field, Virginia, and soon caught the eye of Henry H. Arnold, commander of the Army Air Forces. When Major Norstad was summoned to Arnold's Headquarters, he wondered if he was in for one of the famous Arnold dressing-downs. Instead Arnold told him, "I need someone to help me do my thinking." After becoming a Lieutenant Colonel, he was assigned to Arnold's advisory council "to assist in making studies on which high-level decisions are based." During the landing of Anglo-American forces in North Africa, November 7, 1942, Colonel Norstad was operations officer of the 12th Air Force, planning operations out of the new mud airfields in Algeria. In February 1943, promoted to Brigadier General and was an operations officer at Mediterranean Allied Air Force Headquarters at Caserta, Italy. By May 1945, Major General Norstad was assistant chief of the air staff in Washington, DC. After World War II, he was one of service officers who helped tie together the loose ends resulting from the separation of the Air Force from the Army and its organization as a separate sservice. During military career, recd many US, foreign decorations. Promoted to Major General in June1945 he had direct responsibility for planning the atomic bomb missions carried out in August against Japan. In June 1946 he was appointed director of plans and operations, Division of the General Staff. 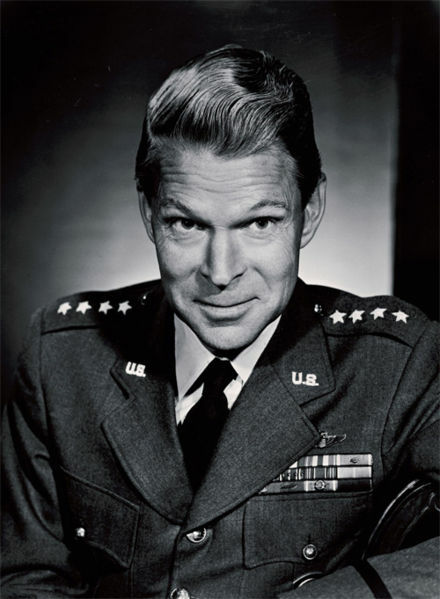 In that post he played central role in Army-Navy negotiations that led to National Security Act of 1947 and, with Admiral Forrest P. Sherman, helped draft the act. Under its terms he was transferred into the newly independent Air Force in September 1947, receiving promotion to Lieutenant General and became acting vice Chief of Staff for Operations. In October 1950 he was named commander of U.S. Air Forces in Europe at Weisbaden, West Germany. He was promoted to General in July 1952. A year later became air deputy to Matthew B. Ridgeway, Supreme Allied Commander in Europe, continuing in that post under Alfred M. Gruenther and in November 1956 succeeding Gruenther as commander of all NATO forces in Europe. He remained in that post until he retired in January 1963. Later in that year named President of Owens-Corning Fiberglass Corp. He was Chief Executive from 1967 to 1972 and chairman from 1967. He died on September 12, 1988 and was buried with full military honors in Section 2, Grave 4954, Arlington National Cemetery. Lauris Norstad was born in Minneapolis, Minnesota, in 1907. He graduated from the U.S. Military Academy June 12, 1930 and was commissioned a second lieutenant of Cavalry. That September he entered Primary Flying School at March Field, California, and graduated from Advanced Flying School and was transferred to the Air Corps in June 1931. Going to Schofield Barracks, Hawaii, in January 1932, he was assigned to the 18th Pursuit Group, assuming command of it in July 1933. In March 1936 he was named adjutant of the Ninth Bomb Group there. Entering the Air Corps Tactical School at Maxwell Field, Alabama, in September 1939, he graduated three months later and returned to Mitchel Field as officer in charge of the Ninth Bomb Group Navigation School. Moving to Langley Field, Va., in July 1940, General Norstad was Adjutant of the 25th Bomb Group, and the following November he was named Assistant Chief of Staff for Intelligence of General Headquarters Air Force there. In February 1942 he was appointed a member of the Advisory Council, to the commanding general of the Army Air Forces at Washington, D.C.
moving with it to Caserta, Italy, two months later. of staff of the Air Force. Joining the U.S. Air Forces in Europe in October 1950 General Norstad was commander in chief, USAFE, with Headquarters at Wiesbaden, Germany. On April 2, 1951 he assumed additional duty as commanding general of the Allied Air Forces in Central Europe under the Supreme Headquarters of the Allied Powers in Europe. He was designated air deputy to the supreme allied commander, Europe, SHAPE, on July 27, 1953. Relieved of duty as air deputy to supreme allied commander, Europe November 20, 1956, the president appointed General Norstad to become supreme allied commander, Europe, and commander in chief, U.S. European Command. His decorations include the Distinguished Service Medal with oak leaf cluster, Silver Star, Legion of Merit with oak leaf cluster, Air Medal, and the French Legion of Honor. He is rated a command pilot, combat observer, and technical observer. 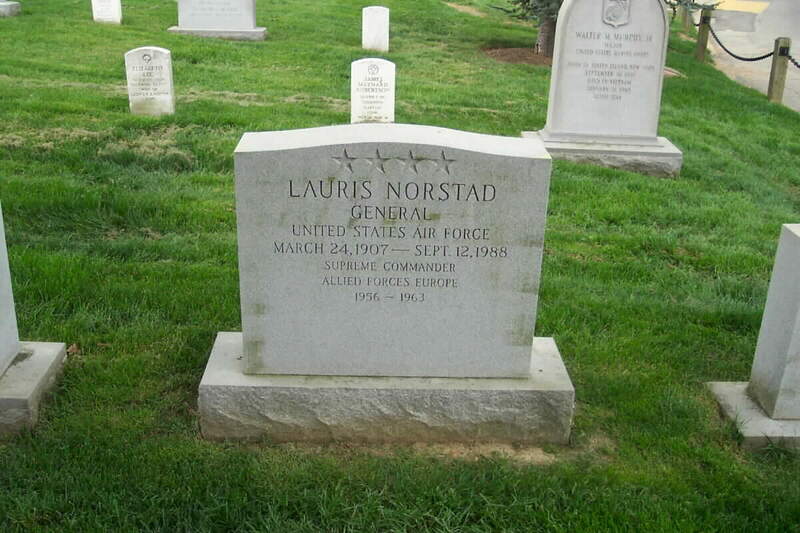 General Norstad was buried with full military honors in Section 2, Grave 4954, Arlington National Cemetery.